Please read the information below to help you select the correct ticket type. • Congress programme on Wednesday (ending at 3.30pm). Accommodation is NOT included. A list of options to suit different budgets is available here. 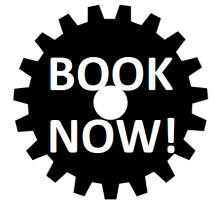 Early bird booking rates – giving you £50 off the full congress package (or £30 for the already heavily discounted early career staff rate) – end 8th April. Most UK universities with an engineering department or faculty are members of the EPC. To check whether your institution is a member, please click here. Partner organisations may also attend Congress at member rates. This is a discounted rate. Most UK universities with an engineering department or faculty are members of the EPC. To check whether your institution is a member, please click here. Partner organisations may also attend Congress at member rates. If you are not a member, you are still very welcome. Please select this rate. Any academic staff at EPC member institutions who have been employed in academic roles for no more than five years qualify for this rate. Additionally, there are 10 free spaces available for ECS, a maximum of one free space per university. Apply for your free space here. A worrying convergence of challenges, outlined in a high-profile report published today, is threatening the vital role of higher education in supporting the UK’s engineering sector, a critical part of the country’s economy. 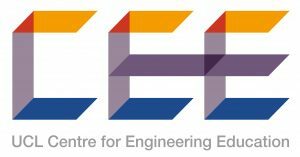 Led by the Royal Academy of Engineering and with significant input from the Engineering Professors’ Council (EPC), Engineering Skills for the Future – the 2013 Perkins review revisited has found key barriers for addressing the annual shortfall of 59,000 engineers and technicians in the UK workforce. In the context of higher education, the post-18 education funding review, falling research revenues and international student numbers after Brexit, proposals in the Immigration White Paper, and the challenge to diversify the intake of students are all cited as issues that could undermine the supply of essential engineering graduates into the UK labour market. The report highlights how the whole education system cannot produce enough engineers to support the UK economy, especially with increasing reliance on home-grown talent post-Brexit. 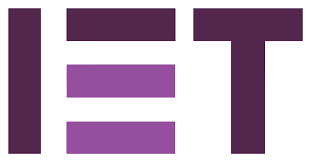 The report, produced by Education for Engineering, an engineering education and skills policy body, makes a raft of recommendations for government including relaxing the rules on how the Apprenticeship Levy may be spent, addressing the shortage of skilled teachers, and ensuring engineering higher education is well resourced and attractive to applicants in the event of changes to student funding. The 2013 Review of Engineering Skills by Professor John Perkins FREng, commissioned by government, was a landmark report, the first to review engineering education from primary schools to professions. Engineering Skills for the Future – the 2013 Perkins review revisited is an independent report from the engineering profession. It revisits the challenges highlighted in the original Perkins Review, and sets out a roadmap for government and the engineering community that identifies urgent priorities for action. The report specifically recommends that the UK must remain part of international partnerships to continue to attract students from the EU and all over the world and should extend opportunities for graduates to stay and work in the country after their studies. It also emphasises the need for top-up grants for engineering courses in the event of any cuts to tuition fees. Also relevant to higher education, is the report’s call for an urgent review of post-16 academic education pathways for England. Young people should have the opportunity to study mathematics, science and technology subjects along with arts and humanities up to the age of 18. The report recommends this to encourage more students from a broader range of backgrounds into further and higher engineering education. The current system runs the risk of narrowing education choices and potentially closing the door to technical and creative careers. “We wholeheartedly welcome this report and are proud to have contributed to its findings. The chain that links the development of tomorrow’s engineers through schools, colleges, universities and into the workplace is broken. This is not just a problem for UK engineering, but for the whole economy. Engineering is at the heart of the Industrial Strategy and Brexit will bring huge challenges in terms of skills shortages. 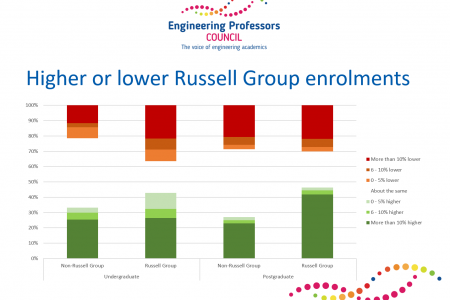 First glimpse official 2017/8 HESA student data appears static in the Engineering and technology subject group (https://www.hesa.ac.uk/news/17-01-2019/sb252-higher-education-student-statistics/subjects). 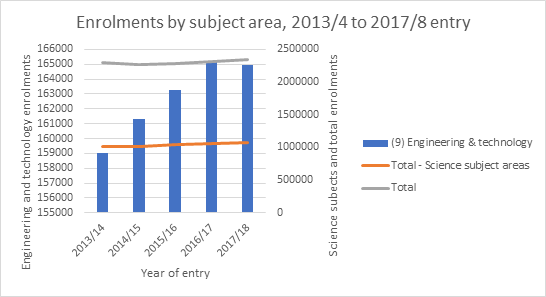 A closer look at the absolute numbers shows a nominal one-year fall in Engineering and technology enrolments – against small increases overall and in all Science subject areas. There was an overall increase in full-time enrolments. 1,105 (1%) more full-time Engineering and technology enrolments in 2017/8 were masked by a part-time slump (-1,285, 4%). This reversal was almost exclusively not first year enrolments; are part-time returners switching to full-time study? There was a small increase in (full-time) undergraduate enrolments. 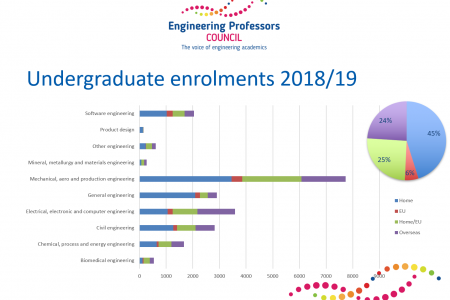 Undergraduate Engineering and technology enrolments were up slightly overall (+ 485) but a similar reduction in part time enrolments (-495) masked a small, 1%, increase (+980) in full-time undergraduate numbers. But there was a drop in the number of full-time undergraduate first years. Down by 2% (-655). There was an increase in first year full-time postgraduate enrolments. These increased by 4% (+660). But a drop in postgraduate enrolments overall. Also down by 2% (-665). Education was the only other subject to see an absolute fall in postgraduate numbers. This was largely owing to a drop in post-graduate re-enrolments. Postgraduate enrolments which were not first year declined by 1045 in 2017/8. The gender gap is closing. Female enrolments in Engineering and technology have increased by 17.5% since 2013/4 compared to a 1.1% increase in males. In absolute numbers, female enrolments have increased 3 times more than male enrolments (+4470 and +1465, respectively). In 2016/7, the number of male Engineering and technology enrolments decreased. First degree is the only level of study where enrolments are increasing over time. 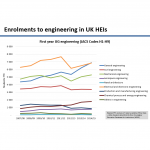 The profile of Engineering and technology enrolments to Welsh providers appears to be changing. In 2013/4, around a quarter of all Wales institutions enrolments were other undergraduate. This proportion has dropped each year to 15.5% in 2017/8. Part-timer enrolments to Wales have fallen correspondingly, from approximately 1 in 3 to 1 in 4 in the same period. A more granular level of student enrolment data will be available from HESA at the end of January. 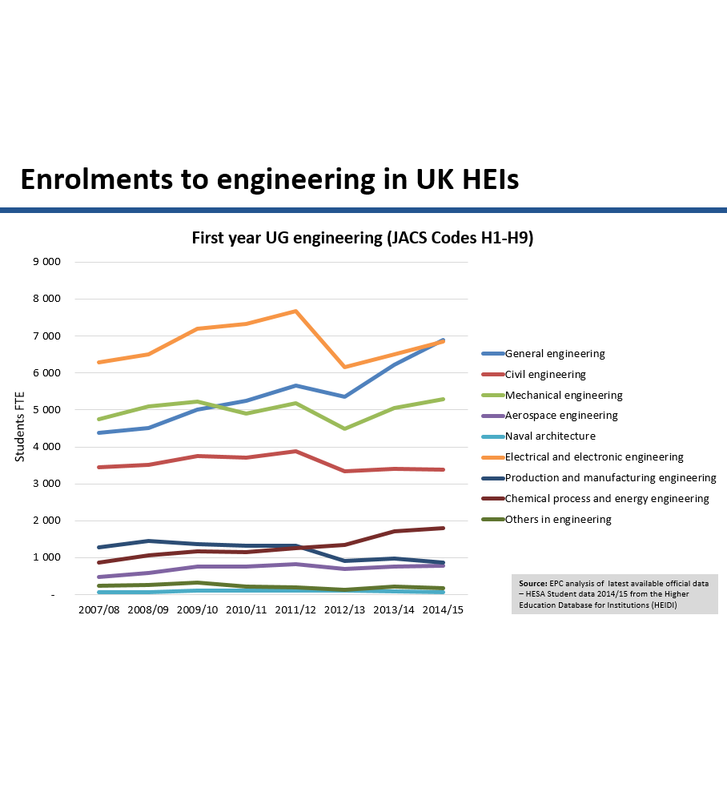 An interim assessment of placed UCAS applicants for this autumn highlights that engineering follows a sector-wide slide in placed applicants overall but bucks a sector increase in applicants placed from the EU and a bumper crop of placed applicants from overseas. Of course, this is only part of the story – in so far as it is limited to undergraduate unconditional firms through UCAS, is a snapshot taken quite a while before movement is complete, and will not translate directly to enrolments – but the findings highlight the importance of getting a better picture of actual enrolments as early as possible. 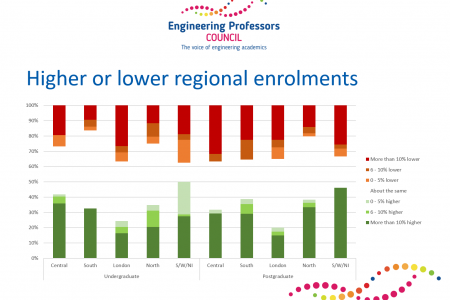 The only way to get an early look at the patterns of actual enrolment is through the EPC’s engineering enrolments survey, and the more universities participate, the clearer the picture will be. Never has this early insight been so critical. 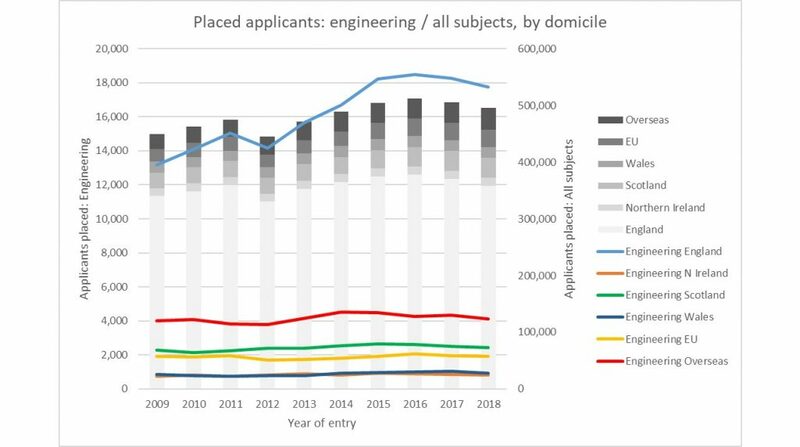 Applicants placed on undergraduate engineering courses through UCAS looks set to fall for the second year running. 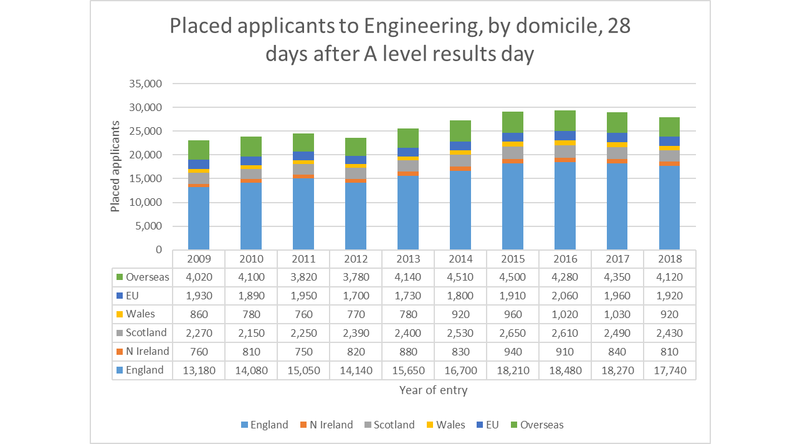 The latest UCAS data, which gives the 2018 entry position 28 days after A level results, shows that the number of applicants accepted to engineering through UCAS has fallen below 28,000 at this point in the cycle for the first time since 2014. A look at the national context across all subjects shows that engineering is following the overall trend. 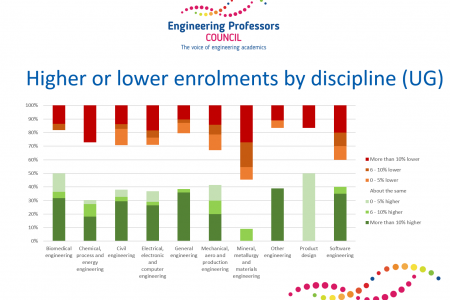 But for pockets of undergraduates, is the outlook worse for engineering? For those from England, the growth between 2009 and 2016 was certainly stronger in Engineering, and the decline is marginally less. This is positive news and represents a significant slice of the market. However, for placed applicants from the remaining UK administrations engineering appears to fare worse than the sector as a whole. 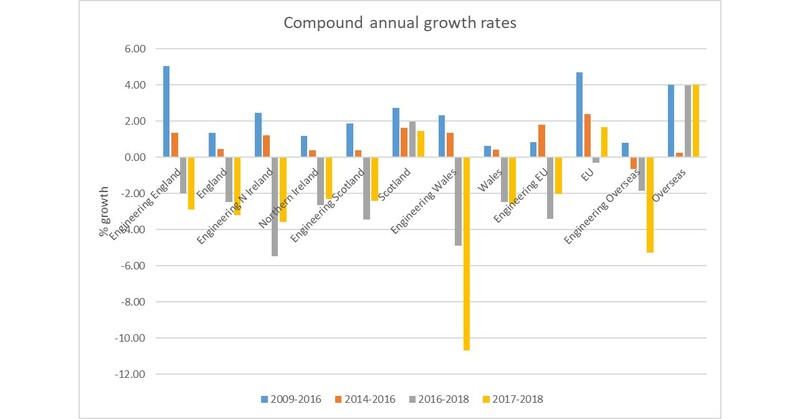 And while the sector saw growth in placed applicants from the EU and overseas (as well as those from Scotland) between 2017 and 2018, engineering did not. Of course, this interim assessment of the 2018 cycle isn’t yet the full UCAS picture, and I am reminded that a count of unconditional firm UCAS applicants doesn’t translate to the bums on seats at enrolment (or even full admissions data). 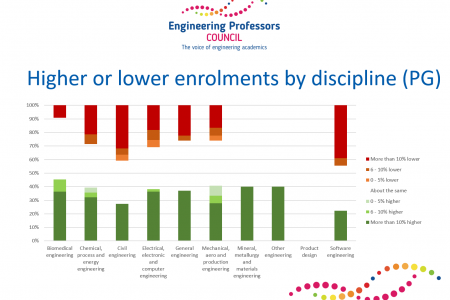 It is not yet possible to say which engineering disciplines have been hardest hit in UCAS terms as data at engineering discipline level won’t be available until late 2018. 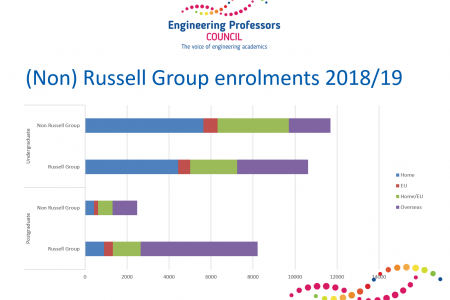 However, the findings of the EPC Engineering Enrolment Survey will be launched on 14th November at the annual Recruitment and Admissions Forum which will be held this year at Sheffield Hallam University. 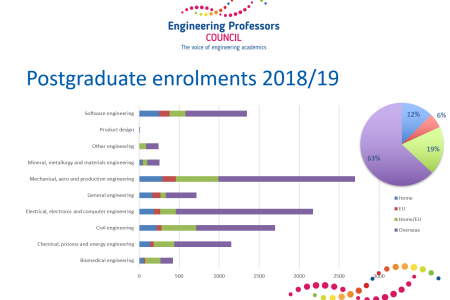 The preview of enrolment patterns to engineering courses at UK universities is critical benchmarking data, valuable for any staff with an interest in recruitment or admissions for engineering departments. 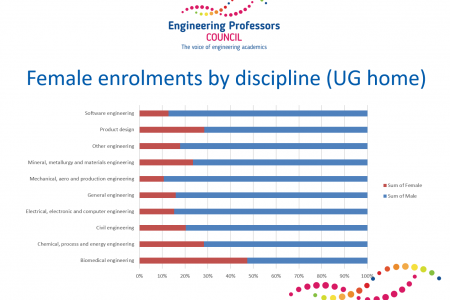 Our survey gives us all a first glance at engineering enrolments long before official HESA data becomes available. You can complete this year’s survey via the EPC website. The Forum also welcomes Helen Thorne, UCAS’ Director of External relations, who promises to share unprecedented insight into undergraduate engineering trends and applicant behaviours. You can book your place here. The full data on which this analysis is based is available to download from the UCAS website. 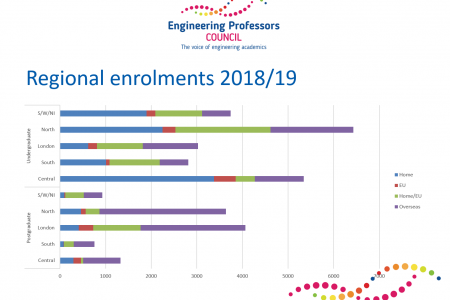 The EPC’s annual engineering enrolment survey gives us all a first glance at engineering enrolments long before official data becomes available. We hope that as many of you as possible will participate again this year; the more responses we receive, the more robust the wider insight we can provide. We understand that enrolment numbers will not yet be completely stable but ask that you provide your best estimates based on your university’s latest information. Our survey will close on 22 October 2018. The results will be launched at the annual EPC Recruitment and Admissions Forum at Sheffield Hallam University on 14th November 2018. The survey results will also be available on the EPC website. Thank you for attaching your completed survey by email to s.fowler@epc.ac.uk. Or for completing it online at http://www.smartsurvey.co.uk/s/82B8J/.. When it comes to new approaches to education, what happens in engineering is the canary in the mine. Along with medicine no discipline more clearly confronts the questions that the whole sector is now facing about the right balance between learning by doing, and learning by understanding. 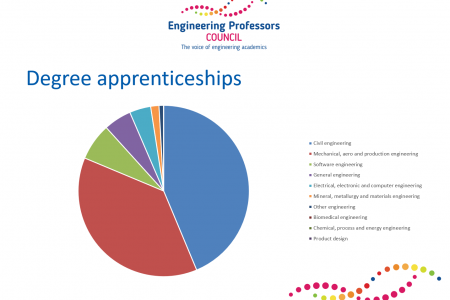 So everybody in higher education should take notice of the current debate in engineering about degree apprenticeships – and the extent to which they could (or should) be a game-changer. There’s a well-documented shortfall of engineering graduates, a shortage of engineering and technical skills, and many employers tell us that graduates are not job-ready. So why aren’t we more excited about degree apprenticeships? This is the theme of a landmark report published today by the Engineering Professors’ Council (EPC), the voice of engineering academics in the UK, representing 7,500 individuals in more than 80 universities. The report states that in order to make degree apprenticeships in engineering a success, we must work collaboratively to put apprentices at the heart of the debate, and make an honest and reflective appraisal of what works and what doesn’t. We also need to convince policymakers that apprenticeships are not currently going according to plan, but that it’s not too late to make the changes required to make them attractive to school leavers and employers. We have arrived at a system where degree apprenticeships are intended to be “employer-led” but instead they often become “employer-dominated”, failing to focus on apprentices’ wider learning needs and long-term goals. In an honest desire to ensure the relevance of apprenticeships, the system may have overlooked what we have already learnt about learning. We need to pool the understanding of academics and of industry to create degree apprenticeships that appeal to prospective apprentices and provide them, as well as employers, with what they need. Degree apprenticeships must be partnerships between employers, providers and apprentices themselves – there is no room for silo cultures here. What’s more, the complexity of the apprenticeship system – coupled with ambiguous messaging and poor branding – is a barrier to potential apprentices, parents and employers – particularly smaller firms. We need a centralised approach to raising awareness among prospective degree apprentices, providing information about options and practicalities. Early intervention outreach must be coordinated, evidence-based and properly funded. And government should relax the rules around the apprenticeship levy to allow some of an estimated £1.28 billion of unspent funds to be used to improve careers advice and to promote degree apprenticeships. But there is still the challenge that degree apprenticeships outputs are themselves ambiguous. The idea of promoting a broad appreciation of the benefits of degree apprenticeships in the current climate is baffling; apprentices’ rights to professional recognition, continued employment and a degree must become clearly navigable in order to move forward. Today’s EPC report, Experience Enhanced, is the collective perspective of the UK’s engineering academic community, the culmination of a two-year project to assess policy and practice around degree apprenticeships. It highlights nearly 50 recommendations spanning four areas: ensuring the best possible learning experience and outcomes for apprentices; the need for closer collaboration between employers and learning providers like universities; the importance of building recognition as a professional engineer into the pathways of apprenticeships; and the financial sustainability of degree apprenticeships. Degree apprenticeships might not be the silver bullet for all recruitment challenges where there’s a skills deficit, but they do bring the rigours of academic learning and knowledge together with the practical skills and behaviours of the workplace – a new breed of “supergrads”? The EPC has published a landmark report calling for changes to degree apprenticeships to deliver a new breed of ‘supergrads’ – graduates with enhanced levels of practical experience. The report, Experience enhanced, is the outcome of a two-year project to assess policy and practice around degree apprenticeships and it highlights nearly 50 recommendations for the Government, for employers and for other organisations such as the Institute for Apprenticeships and the Office for Students. The EPC criticises the Government for creating a system where degree apprenticeships are intended to be ‘employer-led’ but can become ‘employer-dominated’, failing to focus on apprentices’ wider learning and long-term goals. Among the key recommendations is a call for the Government to relax the rules around the Apprenticeship Levy to allow some of an estimated £1.28 billion of unspent funds* to be used to develop high-quality apprenticeships, to promote them and to improve careers advice. The report also takes aim at the messaging around degree apprenticeships. The complexity of the system is described as “a barrier” to potential apprentices, to parents and to employers (particularly smaller firms). The branding of degree apprenticeships also runs the risk of presenting them as something less than traditional degrees, rather than as an enhanced experience. The EPC’s other recommendations span four areas: ensuring the best possible learning experience and outcomes for apprentices; the need for closer collaboration between employers and learning providers like universities; the importance of building recognition as a professional engineer into the pathways of apprenticeships; and the financial sustainability of degree apprenticeships. “The UK has a desperate shortage of engineering skills. Degree apprenticeships could be a game changer in meeting that need and encouraging people from many new and diverse backgrounds into the sector. However, that will only happen if we get them right. The report Experience Enhanced: improving engineering degree apprenticeships is available here. An EPC blog post can be found here. 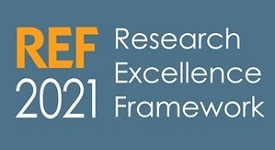 The UK’s HE funding bodies have set out detailed arrangements for REF 2021 and are seeking views from subject communities on the draft Panel criteria publication developed by the REF expert panels. They are also calling for responses on key aspects of the Guidance on submissions publication, which they have developed with advice from the expert panels, including the equality and diversity, and interdisciplinary research advisory panels. The EPC is running a full consultation on this important opportunity to provide feedback. Please complete our survey to share your views. The documents are available on the REF website. This is a somewhat technical consultation in parts, but the detail has enormous repercussions for all of us working in research (or in universities more generally) and, when a consultation is as detailed as this, it means there’s a real opportunity to influence the small things that make a big difference. You can answer the questions quickly in about ten minutes, but to do it thoroughly is likely to take about half an hour and there’s no upper limit if you want to provide full feedback. We hope you’ll take the opportunity to make a difference to this important consultation. Please complete our survey to share your views. Deadline for responses is 28 September. If you find the survey format doesn’t give you the opportunities to express your views in the way you want, please feel free to email your thoughts to the EPC Executive. Venue details will be provided in due course. There will also be additional events for specific groups during the consultation period. Booking information will be available on the REF website. There are also webinars planned with each of the main panel chairs. Main panel B is on 11th September (pm). Booking details aren’t available yet but will be posted here.